So much art! So little time! Artists' studios and galleries will be open Saturday April 27 from 11:00 a.m. to 7:00 p.m. and again on Sunday, April 28 from noon until 5:00 p.m. Sign the Sign-In Sheet at each location you visit and your name is included in drawings for gift certificates at the participating locations. Booklets with more information and maps are available at each site. 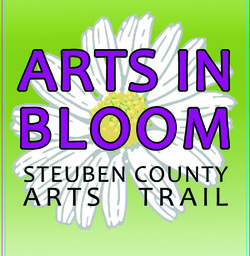 Or go online at the Arts in Bloom webpage.